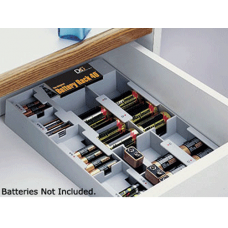 Battery Storage Organizer, holds up to 40 batteries and comes complete with a voltage tester. Those batteries cluttering up drawers in your home. Are they good, dead, or what? 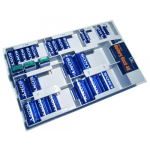 This battery rack lets you store and organize all unused household batteries in one handy place, and even includes a built-in battery tester so you know which ones you shouldn't even bother storing! 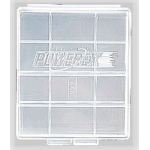 Stores up to 40 batteries (AA, AAA, C, D, 9v Block Sizes). 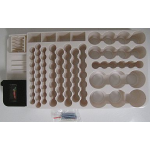 Housing fits drawer, cupboard, or can be wall-mounted (screws included). Battery Rack with Tester meter! Batteries maybe tested with the meter/tester in the rack, or it may be removed from the rack for convenience. 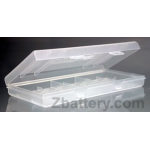 To test AAA, AA, C, D Size batteries, lift the battery compartment cover on the top of the Battery Rack. Slide the negative terminal and hold it there, then place a battery in the compartment according to the polarity symbols(+ and -)marked inside the compartment, then slowly release the bar. If only the RED indicator light is lit, the battery is weak and needs to be replaced or recharged. If RED and YELLOW indicator lights are lit, the battery's power is fair. If RED, YELLOW, and GREEN indicator lights are lit, the battery's power is good. 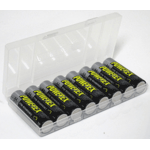 To test 9V batteries, place the 9-volt battery terminal on the contact inside the battery compartment with the positive(+) terminal on the contact marked + and the negative(-) terminal on the contact marked 1. Press the battery down to get good contact. The indicators are the same as for other batteries. Battery tester requires (3) LR44 batteries which are included. Must pull tab from battery compartment before using tester.